This free online calculator will help you to find the perimeter of a square. Using this online calculator, you will receive a detailed step-by-step solution to your problem, which will help you understand the algorithm how to find square perimeter. N.B. In online calculator you can use the value in the same units of measurement! If you have any difficulties with units conversion, you can use the length converter. Square is a regular quadrilateral. This means that it has four equal sides and four equal angles. The perimeter of a square is the product of the length of a square side by 4. The perimeter of a square is the product of the length of a square diagonal by 2√2. 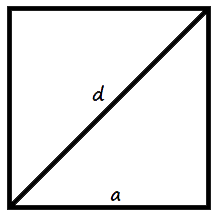 d - the length of a square diagonal.